Departing the Text: Kicking back a bit...What's all this about Inference? Kicking back a bit...What's all this about Inference? In my last post I summarized my C2E2 presentation. What I would like to do this week is kick back, discuss some of the comments and take them a bit further, talking about the nearly unlimited opportunities you can make to read with your kids, talk with them and help them learn to think critically and evaluate the world around them. What's all this about inference? Inference is the act of drawing a conclusion by deductive reasoning. Inferences are assumptions or images we connect or construe when reading, when talking with others, even watching television or movies. Reading and writing poetry is an example of making inferences. In poetry the reader provides images, similes, metaphors that the reader must interpret in order to fully comprehend the author's intent. Some people describe making inferences as 'reading between the lines' which is SO appropriate when talking about reading graphic novels. We make inferences all the time - at work, at home, talking to colleagues and friends, in school, at play, when reading, when thinking about the world around us. The thing about inference, though is that it is actually hard to teach and hard to learn. 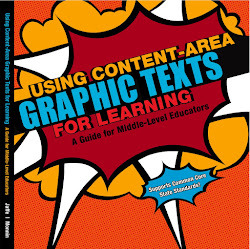 Graphic novels are so helpful because they provide so many cues - text, art, and even page design all provide the reader with important information. What is happening 'beween' scenes (and in the gutters) that is not 'given' or provided by author/artist. 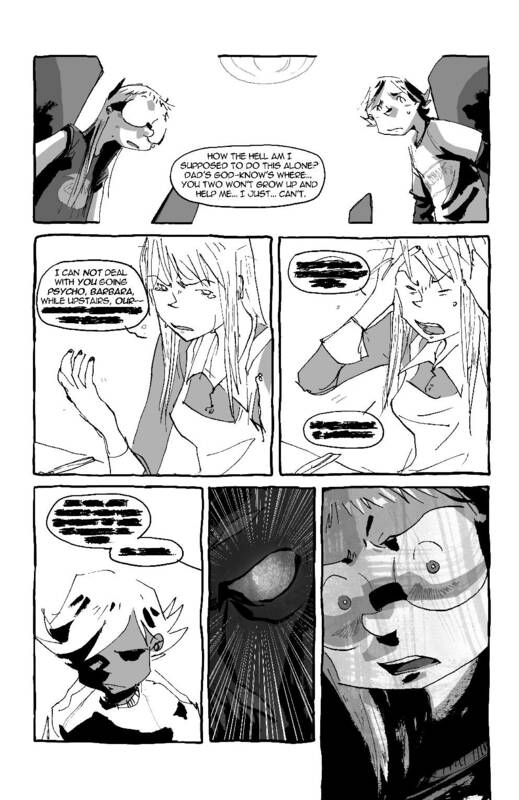 This image s taken from I Kill Giants by Joe Kelly (Image comics). Story Background: Barbara is a fifth grader who tells anyone who will listen that she kills giants. The reader is uncertain at this point if she really kills giants, if she lives in a world of her own, out of touch with others, or if this is one giant metaphor for her having to face huge scary issues in her life. On this page, Barbara is arguing with her sister. Barbara hit the school counselor and her sister was called to pick her up. The sister is really upset. Why does Barabaras's sister have to 'do this on her own'? Why are there words inked out? What might Barabara's sister be saying? Why can't Barabara hear them? What is with the eye thing in the middle panel on the bottom? Why is there a shadow over Barbara's face in the last panel? This is just one page from one graphic novel. Each graphic novel is different in part, because the stories, the art, and the page design are different for each book. That is part of the thrill or reading these new books and formats. As always, the quality and appropriateness of these books vary. While I recommend reading them at home and in school, I strongly recommend that adults look through the books before giving them to kids to check for appropriateness of story and vocuabulary. That said, graphic novels are well worth the effort. How else can you help your kids learn to make inferences? Talk about books you and your kids read (graphic novels, poetry, prose). Ask them what the author intended when she/she wrote something vague or something different. Talk about how the art and the visual details add to the story. Talk about how the choice of color palate helps explain depict emotion. Discuss how the choice of text font and shape add to the story detail. Talk about the titles of books and chapters. After reading them, would you have chosen those titles? Why? Can you think of different titles? Talk about metaphors and similes. They are such graphic means of expression. When you come across them, talk about them. When going for walks talk and think about the things you see around you. Why are they that way? Why do you think squirrels have busy tails? What color do you think is the most popular one for the outside of a house? Why? Design scenes and worlds for dolls/lego designs, trains, dinosaurs as you play together. Talk about the choices your child makes when designing the scenes. What is so great about jello - the taste, the texture, the fact that it jiggles? These questions go on and on. The point is to notice things around you, to notice things others say or write and to think and further analyze and understand them. The more you model and practice critical thinking and inference, the easier it will be for your child to tackle the world around them. What are some of the ways you practice making inferences together? I'd love to hear some of your ideas or questions! Since language disordered kids are quite literal, I do a lot of work on inferencing and higher level thinking. One of the books I rely on for ideas is The Language of Learning by Blank, Rose and Berlin. It gives a lot of ideas for scaffolding so kids can better understand. It's for preschoolers, but I use the same techniques with elementary kids, too. I guess for me, critical thinking is just the way I live my life. I point out everything to my kids: from the way a store is laid out to attract kids' eyes to the right items...to the subtle emotional behavior of a stranger...to understanding why an engaged server at a restaurant seems to be so "good" at what they do. We are constantly analyzing everything in our house, and it is the way my kids have learned to read. You have challenged me to create some more formality with more of the books they read...the older two read so much that I am not reading with them anymore...I sense a summer book club in the works. You have such great information!! Thank you for the encouragement! Your posts give me a lot to think about! I'll be back to read more and in the meantime I think I'm going to be more conscientious of my interactions with my boys in the ways you mentioned to see what I'm already doing/not doing! It'll be interesting to see if little changes/conversations spur a change in Cutie Pie's behavior and learning! Interesting post! I will try it with my daughters. I couldn't help thinking that there is a very fine line between making inferences and empathy. Hi Jaerose. Thanks for the comment. I am curious how graphic novels shatter your allusions about characters, and how they seem like bad adaptations of books on film. Maybe it is the ones you are reading. The really good graphic novels are those made for this format. Maus (by Art Spiegelman), "I Kill Giants" (by Joe Kelly), "Laika" (a kids' graphic novel by Nick Abadzis) are good examples. I'd love to know if you've read them, what you think. To MuMuGB: Yes that is exactly right! You must constantly make inferences when interacting with others as we must constantly read their faces, read between the literal and intended us of words, etc. Thanks. Thanks to Megan, Thelma, and Tricia too! Tricia, I look forward to hearing about the change in conversations! I have seen some amazing graphic novels, and yes, most of them are pretty wanting. One dealt with a boy whose brother had epilepsy. "Maus" must be the first, or at least the most famous, early graphic novel. Whatever the medium - graphic novels, cartoons, TV shows (espec. MTV), the Net (especially gaming, which can be horrifically violent and anti-woman and homophobic) - we owe it to our kids, as good parents, to take time to engage them. Some parents think reading a graphic novel is a waste of time... but if your student is reading it, your own child, you'd better get over it. Otherwise, you will never really know your kid! Absolutely right! I couldn't have put it better. Thank you. Graphic novels have really come into their own in the past 25 years, at least in the US. As a former comic book store manager, I'm awed and amazed by that fact. What I like about reading is the world which you enter and then I don't like to be disturbed by all kind of games or questions, because then I will be forced to leave that world and look at the story from a distance. I like to create my world by means of the book. Actually I still don't know what "inferences" are. I agree with Roger, it is amazing how such graphic novels have come into their own in relatively recent years. Great post for the day Meryl! Thank you Roger, Reader Wil and Sylvia for your comments. I agree that this new surge is amazing. Also I want to iterate wil's point, that there are times we need to get lost in a book just for the book's sake - not to play games or answer questions. Kids, however, need both experiences. We, as teachers and parents have to make sure they have the time, opportunities and materials to do both. I am so sorry I have not been clear. An inference is when you deduce something - when you assume or construe. We make inferences ALL THE TIME in poetry as the author provides images,similes, metaphors that we have to interpret and make meaningful. These are all types of inferences! Have a little tour of Korea, come by and see. Here again, you are certainly no fool and bring up an excellent point. The thing is that while the illustrations, provide concrete images of people, places, events, things they also provide opportunities where the kids have to construct intentions, motives and emotions (there is no narrator to provide these). So while in regular prose novels readers have to construct what people places and things look like, in graphic novels they have to construct intent, emotions and motives. With each format you "create" different types of images in your head. Here's to unlimited opportunities for our children; most interesting and the Q&A in the comments certainly added a lot. My kids are grown and gone, but I can see where your blog would be a Godsend to those parents with kids still in their formative years. Thank you so much for stopping by my ABC Wednesday entry and leaving such a nice comment. Hope to see you back another day. an interesting article. thank you for explaining with the poetry reference ( still tend to dabble in it, post it occasionally) for people like myself who don't always have the right connections in my head to know what your are meaning. I have not read graphic novels, just seen what I suppose are references to them in movies & bits of Anime (correct word? )of course I have read the old fashion comics and regular print books. My sons had varied interests in reading when at home, the oldest very wide range from print to comics & I am sure graphic novels... he was always a great reader, like I used to be( I have a few mental & physical problems that get in the way to being able to just sit & enjoy a good book). the youngest did not want to waste time on written word & it wasn't until older he found that a book can bring forth imagination & adventures. I look forward to reading more here. thanks for linking up by me so I could find you! Interesting share, and i definitely some with your post. Thank you for dropping by my blog and commenting on one of my poems! This A great post, I thoroughly enjoyed reading it! The ability to Infer is a very important skill in so many facets of life. I work for a treasury in a bank and we deal with some complicated financial products. When trying to work out how pur products might be affected by markets, a high level of inference (often statistical) is required - just one application amongst countless in this world. Very much looking forward o reading more of your posts! You have an interesting post for the letter K .. I have sent Sean Connery a special request. he needs to answer a burning question. Hw will be at your place in his kilt. You can then tell us. a quick visit here...thanks for dropping by!